The bleakest tasting I've done in years was of worldwide Muscats and Moscatos. Wow, is some terrible wine being peddled to consumers who probably don't know any better. Fortunately, there were a few exceptions, like the very expensive ($30) dry Muscat at right. But many of these new $7 Muscats in the supermarket are awful, and not because they're sweet. I recommended a number of delicious sweet sparkling Moscatos from Asti, Italy and one frizzante one from California. There are some great dessert wines made from Moscato. But the majority of these wines tasted like corn syrup flavored with cheap perfume. Some weren't even that good -- they tasted more like mouthwash blended with a huge pile of aspartame. More than once I walked away from a glass going "eww ... eww ... eww." Why did I do this to myself? Because somebody paid me, of course. My special report on Moscato for Sommelier Journal is out this week, but you have to either buy the magazine or pay $4 online to read the whole article. Sorry about that, but SJ has to make the big bucks they pay me somewhere. 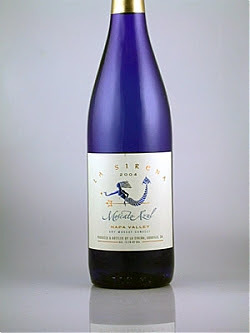 But I will give you the unsurprising teaser that Heidi Peterson Barrett's La Sirena Napa Valley Moscato Azul is fantastic, and was the only bottle of scores that I tried that two of us had no problem finishing in one night. That's the thing about sweet sparkling Moscato: even when it's good, a glass or two is really all you want. I know I can say that about you because you're reading a wine blog. I also know there are plenty of consumers who can drink sweet sparkling Moscato all night, but then there are plenty of people who can drink RC Cola all night. To each their own. La Sirena is a Muscat for wine lovers, not necessarily for Moscato lovers, who might wonder where the sugar is. It's bright and fruity, has some complexity and fantastic balance and just keeps tasting more delicious. I love the blue bottle, I like the logo, but mainly I just love this wine. Barrett's wines aren't cheap; this is the easiest way to see what she can do. And you can order it from her online. I have a friend, Susan A., who swears "Domo arigato Mr. Roboto" is the worst pop song ever released. That's a tough call. But commercial Moscato from outside of Asti, Italy might be the worst major category of wine I've ever tasted. That's why when I got a good one, this one, I spontaneously burst into "Domo arigato Mr. Moscato ... domo ... domo." With apologies to Barrett, who is nobody's Mr.
Just reading about the "HFCS - cheap perfume - Aspartame nexus makes me queasy. The last couple of years have been fruitful for the local wine-bar scene, thanks to a pair of new establishments sporting advanced wine technology and a starring role for regional vintages. At Vinomania (193, rue de Bourgogne, 33-2-38-53-83-18; orleans.vinomania.fr), wines are stored in Le Bag-in-Box, an airtight bag within a cardboard carton that maintains freshness for extended periods. The bar’s very red interior is the ideal spot to sample the red-heavy menu of some 40 wines by the glass, including a medium-bodied, juicy, herbal Domaine de Chalusson (3.50 euros a glass). Don’t let the medieval dungeonlike confines of Ver Di Vin (2, rue des Trois Maries, 33-2-38-54-47-42; verdivin.com) fool you: The underground bar is high-tech, courtesy of temperature-controlled Enomatic machines that pour doses of wine with the press of a button. Les Moines Noirs (4.50 a glass) is a fruity and smooth red for easy drinking." Lisa: More and more wineries are selling wines on tap to restaurants these days. It's much better for the environment, as glass is heavy to ship, and it keeps wine fresher for wine by the glass. Ask for wine on tap at your favorite restaurants. I imagine if there is restaurant resistance, it's because they aren't convinced consumers will buy them. Wine on tap -- thanks. Round these parts it's still Mountain Dew and Pepsi, I'm afraid ... the HFCS-Aspartame axis; the ladies add the perfume for good measure. Pyramid Vineyard, in the new 2006 Ramona AVA in San Diego county, offers several Muskies, dry and not. The Muscat blanc, Ramona Valley, Estate bottled, 2010 is the dry. Quite nice. Moscatos are growing well in the new vineyards here in the area. Many new wineries, small productions, not much distribution, so, I invite all to come on down and visit Ramona, weekends. Most have real day jobs. I am not affiliated with any, I teach wine locally and think Ramona and San Diego are home to some excellent wines.